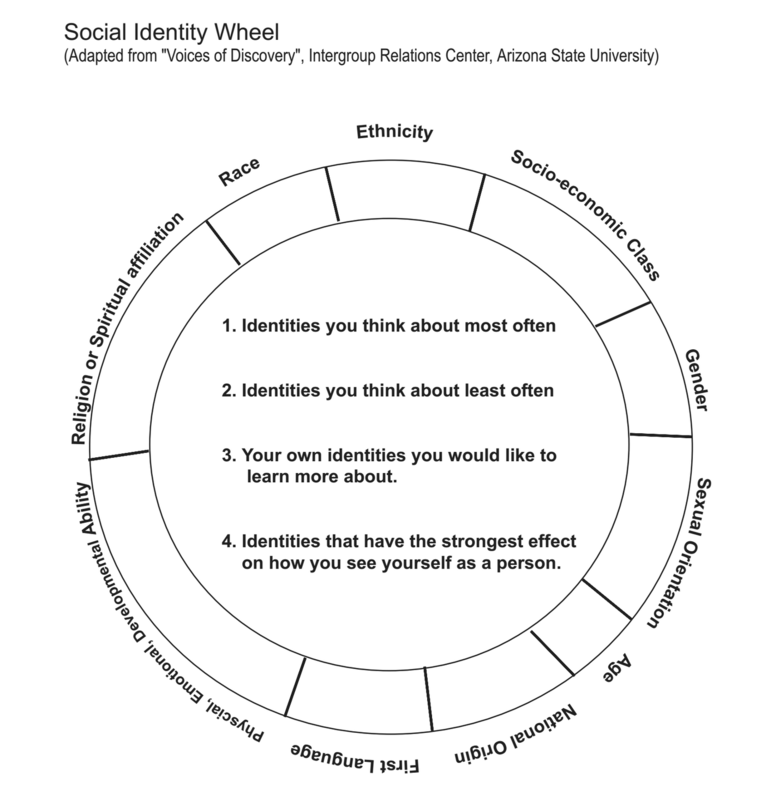 We have students fill out “identity wheels” but don’t interrogate how those multiple forms of identity compound in our own complicity in the oppression of students. We treat intersectionality as if it’s simply a way to understand our differences. We need to be clear, though, that Crenshaw didn’t take up critique of the ways that discrimination law erases Black women by framing “subordination as disadvantage occurring along a single categorical axis” (p. 140) to paint a cute, liberal portrait of the unique experiences of Black women. She was making a pointed argument about how the very law that feigned protection for Black women was further marginalizing them by refusing to consider their oppression at the intersections of identity. In short, intersectionality isn’t a theory of difference. It’s a theory of oppression. And when we treat it simply as a way to understand our differences, we erase its powerfully subversive critique. “It may be a euphemized form of violence, a discursive ‘cool violence’ compared to the ‘hot violence’ of economic exploitation…but linguistic racism is no less a violation…maintains links between material distributions of power and a politics of recognition…and lowers standards of humanity. It reaffirms Zizek’s (2008) insight that violence is part of the fabric of the daily functioning of social life where systemic and symbolic violence passes as natural” (p.140). Of course, it’s seductive for those with access to power and privilege to (intentionally or unintentionally) treat intersectionality as a frame for understanding how our identities are complex. But it is because of the fact that understanding intersectionality as a frame for difference erases the power I hold as a White cisgender man and the ways I am complicit in oppression that such erasure is an act of colonization. What’s driving the colonization of intersectionality? Said simply, the problem is liberalism. No, not that liberalism, not the “R vs D,” “the democrats are liberals” type of liberalism. We’re not talking about partisan politics. We’re talking racial liberalism in the sense put forth by Charles Mills and Kimberlé Crenshaw. Liberalism reflects a way of thinking about injustice and inequity in society. Liberalism as an ideology emphasizes reform – relatively small tweaks to fundamentally unjust systems – that preserve the overarching structure and as a result poses little threat to the racial contract. Whereas intersectionality (as a tenet of Critical Race Theory) challenges the very foundations and structures of our society, demanding profound transformation, liberalism (by intent or impact) preserves Whiteness as property and the White supremacist, capitalist hetero-patriarchy (to borrow from bell hooks). Crenshaw makes an important distinction between expansive and restrictive views of equality, noting that critical activists, educators, and theorists seek transformation that impacts the lived realities –the actual outcomes – of people of Color and other oppressed groups. Liberal reform, though, serves a “restrictive view” of equality, which treats equality as a process, downplaying the significance of actual outcomes. “The primary objective of antidiscrimination law, according to this vision, is to prevent future wrongdoing rather than to redress present manifestations of past injustice. ‘Wrongdoing,’ moreover, is seen primarily as isolated actions against individuals rather than as a societal policy against an entire group” (p. 1342). For example, the overwhelming and oft-unexamined Whiteness of teaching lends itself to a liberal view of equality in schools, and as such, there is a long history of liberal cooptation of racial justice projects in ways that serve the status quo and offer little hope of transformative change. The “multiculturalism” movement in education originally started as one calling for radical restructuring of curriculum and pedagogies to meet the needs of students of Color who are owed an education debt. Such a radical restructuring would demand a great deal of White teachers, particularly as it relates to divestment from Whiteness, and as such, those committed to Whiteness have managed to coopt the concept into a liberal, feel-good approach to education that highlights “food, festival, folklore, and fashion.” Similar to what’s happening with the colonization of intersectionality, multicultural education was divorced from its critique of White supremacy. Though I’ve been describing the colonization of intersectionality in some really abstract, theoretical ways, it’s actually playing out in specific manifestations that demand interruption. Here are but three of approximately one million that can help to ground the abstraction. Columbusing refers to the all-too-common act of White people taking something that was originated by people of Color, divorcing it from its roots, and re-appropriating it in some way that serves White interests. Ironically, I couldn’t actually trace the term Columbusing back to its originator (though it seems fitting to perhaps credit Urban Dictionary contributor Harunei). My point here is to highlight just how common and insidious the Columbusing can be. In my slide, I did give credit to Crenshaw, but I twisted the meaning of her term in a way that serves White liberalism. Another common act that contributes to the colonization of intersectionality is using the term to avoid accountability for one’s privilege. I’ve seen it countless times to avoid accountability for being called out on all sorts of unchecked privilege, though most often I’ve seen it from fellow White folks. There’s the appeal to another aspect of marginalization with a surface-level appeal to intersectionality to shift the focus of critique away from oneself. With White men, the appeal usually is to one’s class/wealth status to avoid being held accountable for one’s privilege, or among White Queer men, we default to identifications of our Queerness and intersectionality. But with White women it can get a little more complicated. A common way this happens is when White women are reminded of how their tears can function in spaces of interracial dialogue or conflict as a tool of oppression of women of Color, as it can lead to the centering of the White woman’s feelings and a shifting away from the critique that was offered which led to the tears. Many times, I have seen this shift done while directly citing how we need to be “intersectional” in how we offer critiques. When a surface-level understanding of interesectionality is used as a cudgel against those offering us criticism of how we wield our societal power, we have completely bastardized the concept. No part of intersectionality as a theoretical frame demands that those who are oppressed temper their criticisms of those with power in order to avoid offending those with power because they also hold marginalized identities. Perhaps the most common and pervasive way that White folks are colonizing intersectionality is through the near-constant use of the term in White leftist circles without any clear attention to work to dismantle White supremacy. Phrases like “we really need to be more intersectional” or “intersectionality matters” or “let’s make sure to bring in an intersectional analysis here” could not be more common. Yet when we are pressed to do work that might actually decenter Whiteness or challenge systemic White supremacy in our spaces, we don’t show up. A perfect example is at my university where students with multiple marginalized identities came together to offer a list of demands from the institution. More than a year later, relatively few of the demands have been met, and the very same administrators and university personnel who use the language of interesectionality constantly have stood in the way of possible changes because they were “unrealistic” or would (for example) damage the university’s relationship with Border Patrol (a fundamentally oppressive and violent institution). White folks in social justice circles have a responsibility to interrupt the active colonization of intersectionality. We have to demonstrate a will to change our own investments in realizing racial justice, part of which means pushing past platitudes and surface-level rhetoric to actually strive for more accountable commitments to people of Color in working for justice. We must stop using the term unless we’re being faithful to the originator’s critique of power and oppression, particularly centering and emphasizing race as a central operating principle in the oppressive project that is Western capitalism. If we are using intersectionality as a frame for understanding the difference rather than for understanding power, we are participating in the colonization of the term. We need to stop erasing Black women (most notably Kimberlé Crenshaw) in how we talk about intersectionality. And we must work for more nuanced incorporation of intersectionality, not just as a term, but as a way for understanding oppression and for working to dismantle oppressive systems in which we are often most complicit. While there’s no simple playbook for taking up truly intersectional praxis, there’s one obvious place we can start: listen to and follow the leadership of people of Color, most often women and Queer folks of Color, who are living intersectional resistance and calling for accountability from those of us who are complicit in colonizing intersectionality.